Drawstring bags are very handy to have in your suitcase to organise clothing and supplies. 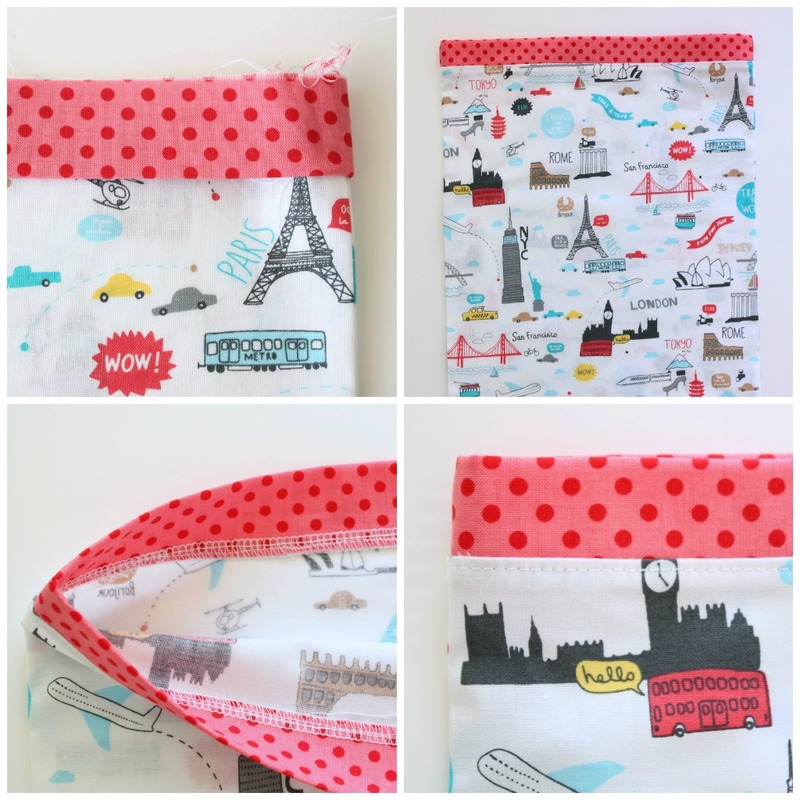 To store Sarah’s new travel themed PJ’s, I made up a little drawstring bag to match. It is an unlined drawstring bag as we didn’t want to add extra weight to our luggage! They will be perfect for storing the Pyjamas in her suitcase on our next holiday. Colourful PJ’s pants, a drawstring bag, and some travel sized toiletries would make a great gift idea for a teenage girl. 1. 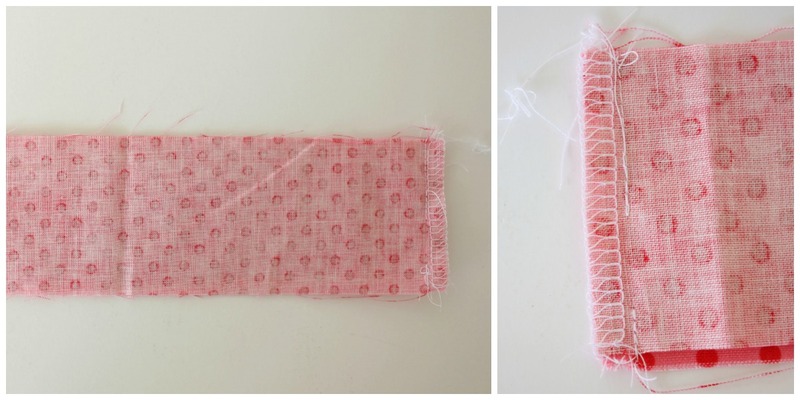 Place the two fabric rectangles with their right sides facing. Stitch around the bottom and the two sides using 1/4 inch seam allowance. Overlock (serge) the raw edges. 2. Overlock (serge) the edges on the short sides of the polka dot strips. Place the two strips of fabric with their right sides facing.Stitch them together at each end, leaving a 1/2 inch opening as shown in the photo. (This is where the drawstring will pass through). The polka dot fabric is now a circular piece. 3. Press the seams on the polka dot fabric open. Fold the fabric in half lengthwise and press. 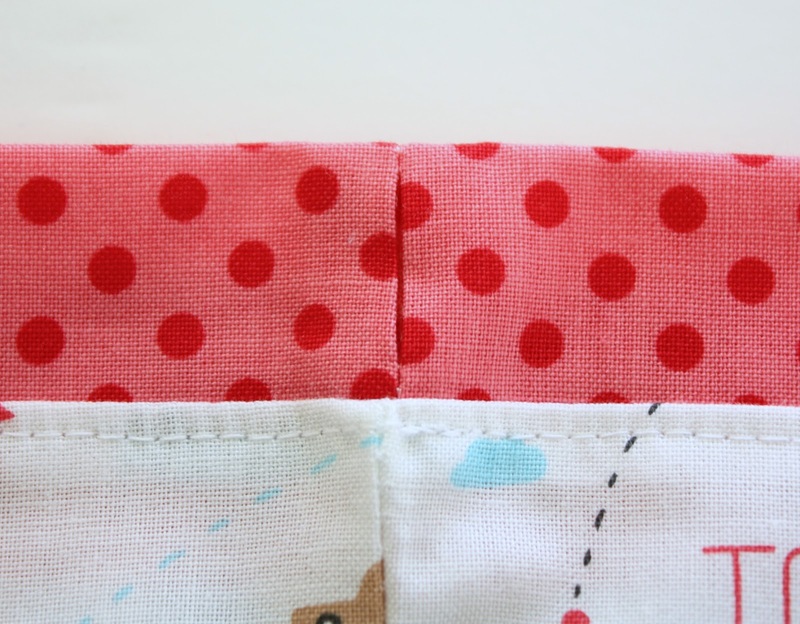 Pin the raw edges of the polka dot fabric to the opening of the bag, with the seams aligned. Stitch in place around the opening of the bag. Overlock the edges. Press. Topstitch around the opening of the bag as shown in the photo. 4. Cut the twill tape in two. Thread the twill tape in one opening using a bodkin or safety pin. Thread the tape right around the drawstring casing until it comes out the same end that it started. Tie the ends together to secure. Thread the remaining piece of twill tape through the opening in the other side, pass it right around the casing, and back out the same gap. Tie ends together. Pull both ends to gather up the bag. Thanks to XO Gigi Fabrics for providing the fabric for this project. I LOVE that fabric, fabulous!! Adorable and so easy to make. I use drawstring bags for so many things. So cute!! And your right,this would make a great gift for a teenage girl or frequent traveler 🙂 thanks for sharing it with us. I LOVE this way to make a drawstring bag! I’ve never seen it done this way before and it’s super-cute. Thank you for another great project. Great Tute! Love the fabric too. 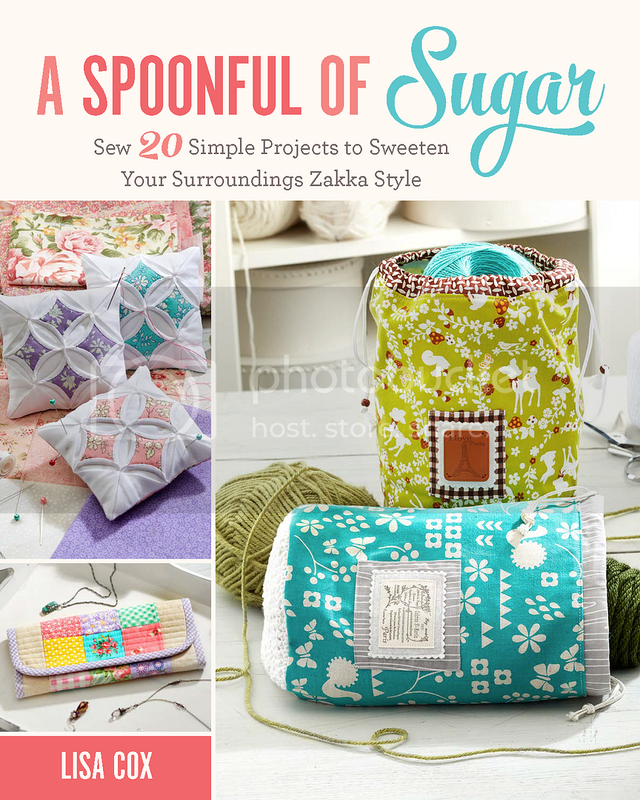 Love your fabric selection….and what a great tutorial!!! Thanks so much. Hiding pyjamas under the pillows is so boring. Thanks to you, my kid won’t have to do it ever again – I’m sure it will be so much fun for him to use such a cute bag! great tutorial … BUT … do you have a pj pattern? that’s what miss 15 really needs! LOVE your fabric choice!!! It’s perfect for a drawstring bag to carry in luggage. This is the first time I’ve even seen the Sydney Harbour Bridge on fabric. I’m trying not to add any fabric to my ever growing stash, but this may well change my mind. 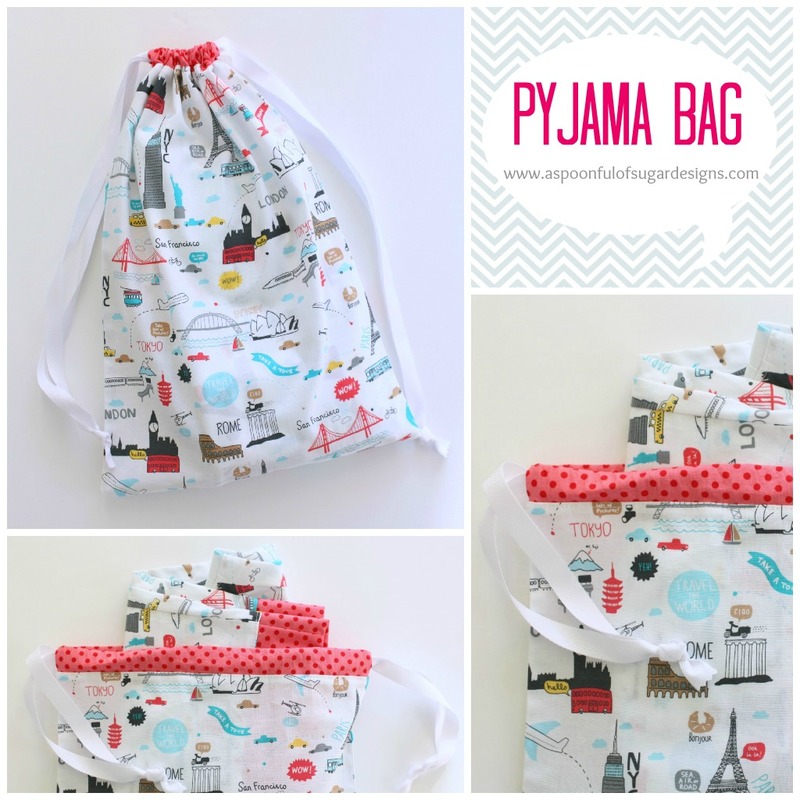 I would love you to share the Pyjama Bag Tutorial at our Ongoing Link Party that’s just for Drawstring Bags . Such a clear tutorial–even I think I could make this! Owww yea! *me gusta* It’s a very nice idea, thanks for the tutorial! I love my stuff organized! 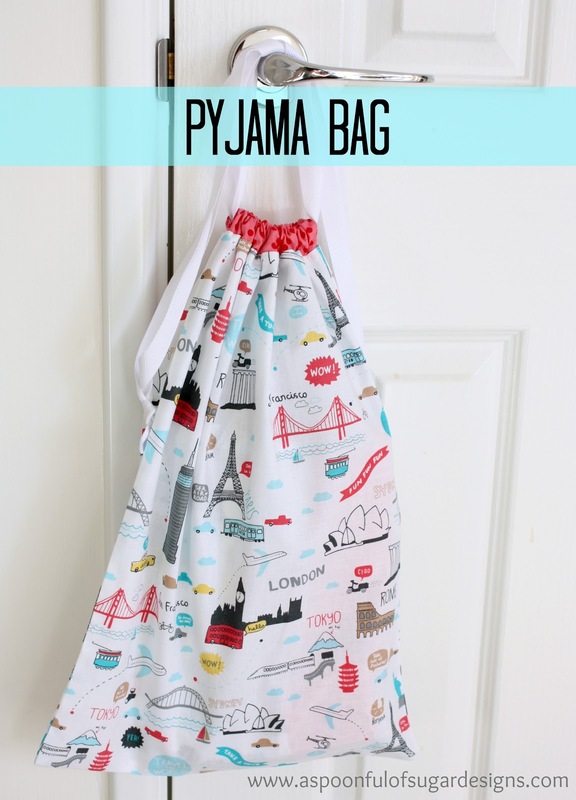 I love the idea of a pyjama bag, and this one is so cute with the contrast band at the top! I wanted to let you know I feature it at Sewistry.com. Here’s the link: http://sewistry.com/2013/08/pyjama-bag/. Thanks! Serge is the same as overlock. It means to finish the edges. If you don’t have an overlocker or serger machine, you can finish with a zigzag stitch to finish the raw edge. Great tutorial thank you for sharing!! !